drivingandlife: SO, WHAT EXACTLY IS MQB? 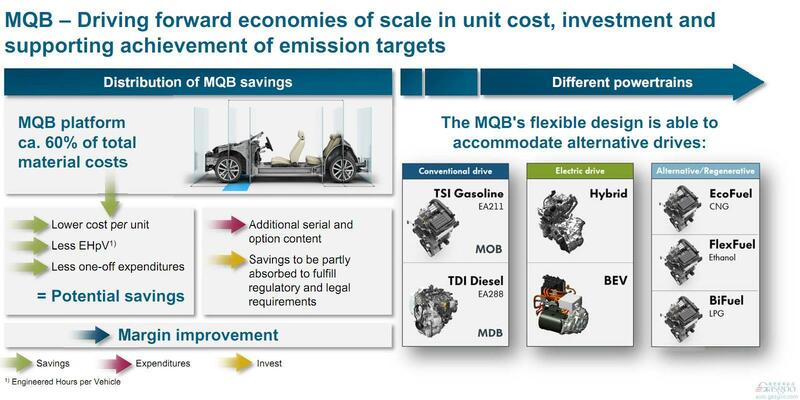 MQB is a system, a process, an engineering light bulb moment, and a brilliant success for the Volkswagen Group (VWAG). Inspired and created by my good friend Ing. 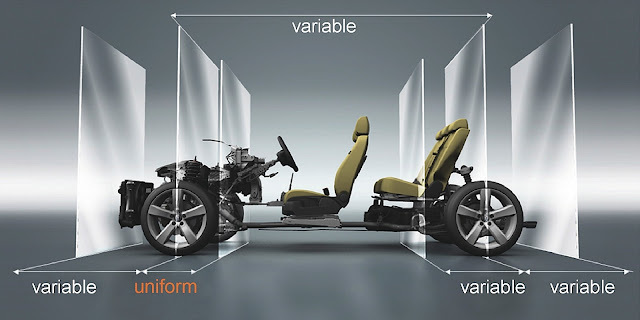 Dr. Ulrich Hackenberg, MQB came along at a time when VWAG was struggling with a multiplicity of platforms, floorpans, powertrains, market pressures and escalating costs to satisfy all the needs of its various divisions. The volume car divisions needed a breakthrough to contain costs, create efficiencies and to produce a variety of models from a smaller product base. When you consider that VWAG produces a huge variety of VWs, Audis, SEATs and Skodas, then you begin to understand the pressure on costs and efficiencies. 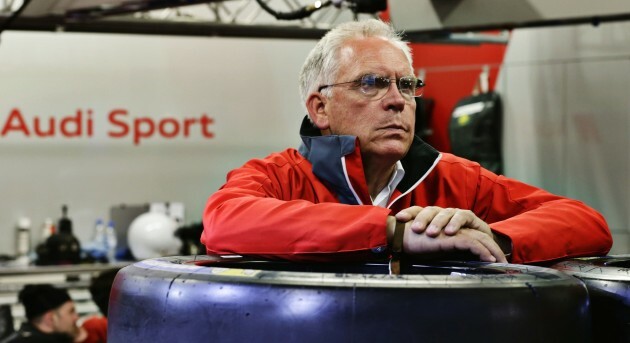 I once incurred the wrath of Dr. Ulrich Bez when he was leading Aston Martin from darkness to light, by describing AM's unique VH platform strategy as an 'arrangement of aluminium boxes'! 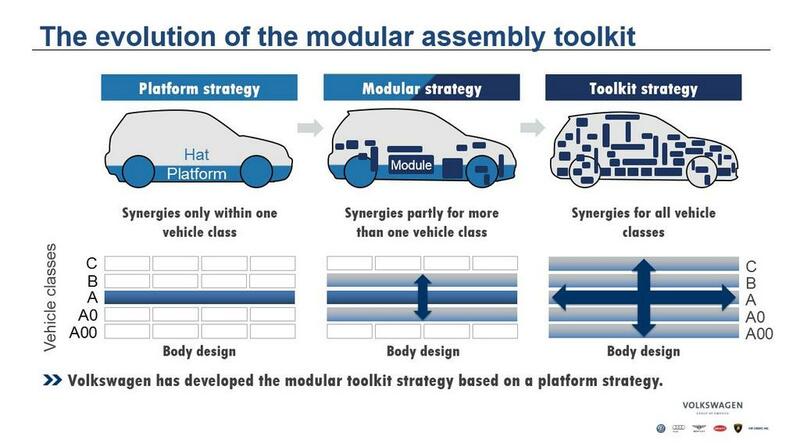 That is, you just arranged the components (or boxes) in whatever complement you needed to produce a certain size car. If it can work for Aston Martin, then it would certainly work for VWAG. Ulrich Hackenberg made sure it did. This post contains a number of graphic illustrations of the idea, and to the extent that they are pretty easy to follow, you will better understand what MQB is, and how it delivers lower costs, greater efficiencies and oodles of choices. Volkswagen is certainly not alone in developing modular strategies, but given the diversity of its brands and model ranges, it has been a very effective solution for spreading the contents of the Group parts bin around its world. MQB (for transverse applications) and MQL (for longitudinal applications) is a great success, and gives freedom to both designers and engineers which was previously unattainable.